Excellent service from CMD yet again, ordered my new T2SE on Thursday and got it Friday morning. Tho..
Bought my first metal detector ace 250 I got a great service. Had the machine in my hands the next d.. 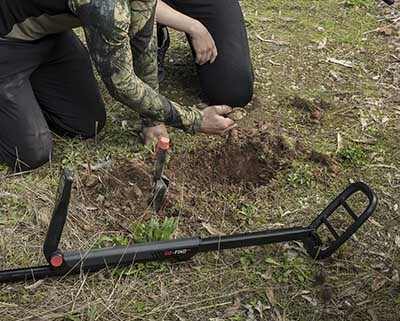 The new Go-Find 44 from Minelab's latest range of Go-Find metal detectors. It is a lightweight, compact, easy to use multi-purpose detector ideal for the beginner to start searching for treasure in virtually no time at all. The compact fold-away design means it takes minimal space in storage and transit, but can be unfolded for use in seconds without need for any assembly. With three find modes and Minelab's Easy-Trak technology you can start searching and uncovering finds without the need for complicated settings. It will intelligently sense the ground type and automatically adjust, reducing ground noise and maximising target signals. Using the simple user interface and find modes, the Go-Find 44 can tell you what type of target you have found by flashing icons. Or you can choose the type of object you want to target utilising up to four pre-set modes. This ease of use makes the Go-Find suitable for treasure hunters young and old. The waterproof search coil* means you can search in shallow water, on the beach or in streams. With Wireless Audio via Bluetooth® you won't need to be tethered to your detector. The standard Smartphone App will link your Go-find 44 with your phone giving you remote control of the detector. It allows phone use while searching, so you could for example listen to music without missing out on hearing important finds. Coin ID Magic helps you to identify types of coins you find before you even dig for them. Treasure View helps you instantly recognise if a target is trash or treasure with colour coded LEDs. Iron trash such as old nails will light up in red. Non iron targets such as coins, jewelry and gold will light up in green, giving you instant feedback on what targets are worth digging for. * The control box / display is not waterproof. Only the search coil and lower stem may be submerged. 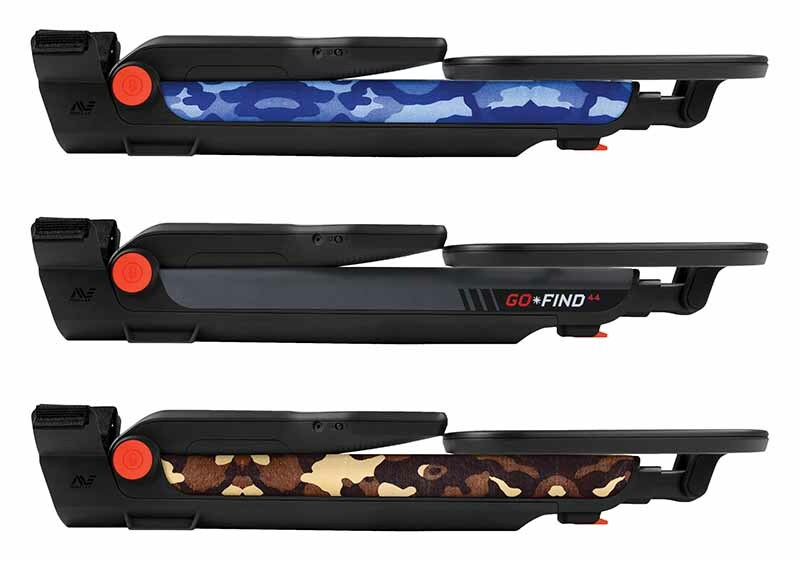 The new range of Minelab Go-Finds come with a choice of protective camouflage skins which you can apply to your detector to suit your style or adapt you your environment.